Youtube Advertising is a video advertisement product from Google. 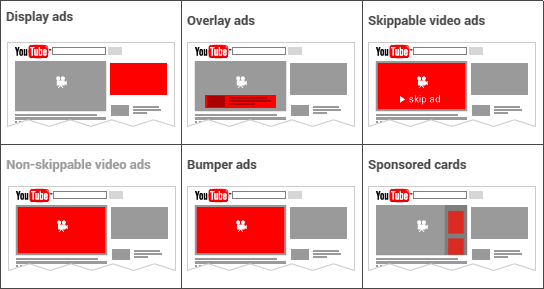 With YouTube Advertising, you can show your video and image ads on YouTube (obviously) to reach its huge amount of users. With several options of advanced targeting method, your ads will be able to reach from broad to highly targeted users, according to your targeting needs. Place an in-stream ad that includes the option for customers to skip the ad within video content. Google uses an auction system to determine when or where the ad will appear. The charge type for this ad is Cost-per-View (CPV), meaning you only pay when a viewer watches 30 seconds of your video (or the duration if it’s shorter than 30 seconds) or interacts with your video, whichever comes first. Place a 15-second video ad or 30-second video ad within video publisher content without the option to skip the ads. This type of ads are sold on a CPM reservation basis, meaning you buy a certain amount of impressions on YouTube and are charged based on it. Promote a video in places of discovery, including next to related YouTube videos, as part of a YouTube search result, or alongside other content across the Display Network. Your ad consists of a thumbnail image from your video with some text. While the exact size and appearance of the ad may vary depending on where it appears, video discovery ads always invite people to click to watch the video. The video then plays on the YouTube Watch page or on your channel page. This type of ads are sold in a CPC basis, meaning you’ll be charged only when viewers choose to watch your ad by clicking the thumbnail. Effectively raise your brand awareness by reaching huge numbers of YouTube users.In Indonesia, more than 86% of internet users use YouTube as their No. 1 source for watching video content. Engage your audience at a higher level. With video, you can deliver more information by the power of visual and sound. You can even affect your audience at an emotional level. Users can watch, comment and share your video with friends and subscribe to your YouTube channel. YouTube’s advanced targeting method can help you reach from very broad to very segmented audience. Reach TV and non-TV audiences. Reasonably priced (CPV) and high performance. Youtube Advertising is highly suitable for companies or brands who want to generate awareness of their brand, products, or services. With the combination of its targeting method and broad network of publishers, you can reach from very broad to very segmented audience.